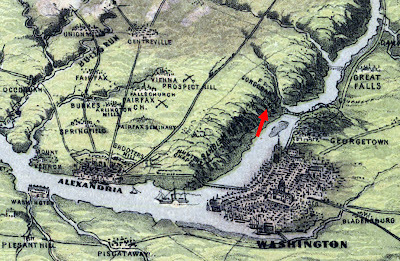 If you look carefully at this 1861 map (click on it for a bigger image), you can see Rosslyn labeled just across from the island in the Potomac. The bluff, which was the rise now most apparent going up to the Netherlands Carillon and to the Arlington House mansion in Arlington Cemetery, is labeled Arlington Heights. Just south of Arlington Heights is Hunter's Chapel. That's the area now at the intersection of Columbia Pike and Glebe Rd. Other than these historical curiosities, Rosslyn is the only point labeled in Arlington. Draw your own conclusions about the rightful territory of Rosslyn. 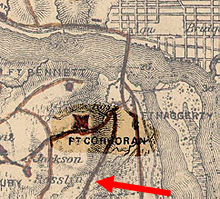 For those doubters, here's another map, this one from 1865, clearly labeling Rosslyn.